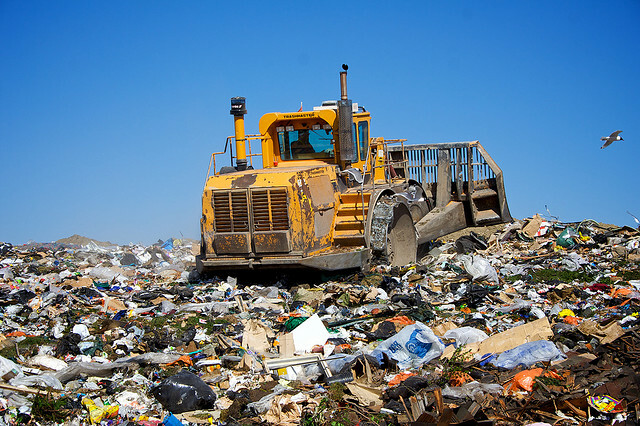 A Michigan proposal to increase the cost of putting waste into landfills would produce an estimated $79 million annually for environmental initiatives. The proposal was presented by Gov. Rick Snyder in late January and is pending in the House Environmental Committee. Part of the proposal would allocate $15 million to support community recycling efforts. That would include $8 million for local recycling grants, $5 million for planning grants and $2 million for market development. Michigan has one of the lowest recycling rates in the nation at 14 percent and throws away $368 million in reusable materials annually, according to a Department of Environmental Quality (DEQ) study. A recycling rate is the percentage of total waste that’s recycled rather than thrown away. The DEQ now provides about $500,000 in grants to local recycling programs annually. Municipalities or other government agencies must match the state funding to be considered for the grant. “Recycling grants can go to whatever makes the most sense for the community,” said Steve Sliver, the assistant director of the DEQ Waste Management Division. “Good policy, planning dollars and grant funding are the keys to a good recycling program,” Elisa Seltzer, the director of the Emmet County Department of Public Works and Recycling, said. Seltzer was hired to start the Emmet County recycling program in 1990. The program has received initial state aid for planning and infrastructure development, along with grants for expansion and education over the years. The county now has one of the highest recycling rates in the state at 42 percent, Seltzer said. There is currently no requirement for counties to report their recycling rates to the state, but the governor’s proposal would add that mandate. Emmet County uses a combination of curbside pickup and community drop-off locations. The goal is that everyone has access to a recycling location within 6 miles of their home. A pay- as-you-throw policy that charges residents for dumping landfill but not recycling incentivizes making the trip, Seltzer said. The county has a material recovery facility, which sorts and processes the recyclable materials to then be sold to manufacturers. The facility also receives material from Presque Isle, Cheboygan and Otsego counties. “Sometimes we wind up covering the cost of the processing,” Seltzer said. “Typically it is easier to be more cost-effective and efficient providing services in an urban environment because everything is more dense and you have more demographics with which to divide any upfront costs,” she said. Communities attempting to expand or begin a recycling program have made more grant requests than the state has been able to fund during the past three years. By focusing on smaller projects and working with communities to partially fund programs, the DEQ was able to help 25 entities in 2017, Freeman said. Despite those efforts, nine entities and a quarter of a million dollars in requests went unfunded. The DEQ has has not been able to assess all grant applications for 2018, but estimates that there are $600,000 in requests. A statewide recycling rate increase poses logistical questions for recycling programs. Sliver said, “If Michigan actually doubled or tripled its current recycling rate, we do not have the capacity with our current material recovery facilities. Recycling in the state “employs 93,000 people, $5.7 billion in annual labor income, and creates $24.3 billion in economic input,” said Kerrin O’Brien, the executive director of the Michigan Recycling Coalition.